March is National Nutrition Month, and you may not have considered that your diet can affect more than just your physical health. Good nutrition is key to a long prosperous life and can influence your oral health. 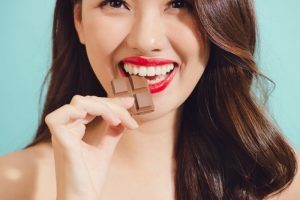 In this week’s blog, your dentist in San Antonio discusses nutrition that can preserve your gums and keep your smile bright! Read on to learn about some foods that will promote a healthier you. White dairy products like cheese and unflavored yogurt have little to no sugar and contain calcium which can help strengthen the enamel on your teeth. Not only can these foods whiten your teeth, but they are also a good source of energy and protein for your body. Lean proteins that are phosphorous-rich, like turkey, chicken, fish, and eggs, can help strengthen your teeth while also providing your body with much-needed protein and curbing bacteria growth. Fruits and vegetables are essential in keeping a healthy and balanced diet. Because they’re high in water and fiber, they help to clean your teeth and prevent bacteria buildup. Eating these can also encourage your mouth to produce more saliva which rinses food particles from your gums and tongue. Be mindful to consume citruses like lemons and oranges in moderation so they don’t have a negative affect on your enamel. Lastly, nuts are protein-packed and great for your overall health. They’re low in carbs, which means that they don’t put you at risk for cavities. Why’s this? Because tooth decay is a result of excessive bacteria growth that’s encouraged by carbs and sugar. Chewing nuts helps produce more saliva as well. Candy and sweets are easy to indulge in, but hard candies can put your teeth at serious risk for a dental emergency. If you constantly snack on sugary foods, the exposure to your teeth and tongue can promote excessive amounts of bacteria growth and result in cavities and infections. Chewing on ice is the equivalent of using your teeth as tools. Even though it’s just water and doesn’t contain anything bad, it can damage your enamel and could cause a chipped or cracked tooth. Crunchy foods like potato chips are not only high in trans fats and salt, but they also get trapped in your teeth. If you do decide to snack on crunchy foods, be sure to take the time to floss afterward to remove all the food debris. If you don’t, it could result in plaque and tartar buildup. Soda is high in sugar that produces bacteria and acids that can destroy your enamel. Not only are they bad for your overall health, but caffeinated drinks also dry out your mouth, creating less saliva to help get rid of bacteria. If you do indulge in soda, it’s a good idea to drink a cup of water afterward to wash the sugar away so it doesn’t get trapped on your tongue or teeth. What’s the best way to keep up with your oral health to avoid other health problems? It’s important to establish an oral hygiene routine that involves brushing twice a day, flossing, and rinsing your mouth with an antibacterial wash. This can prevent plaque and tartar buildup, which keeps you from developing large problems like gum disease, infections, and tooth decay. Scheduling your semi-annual checkup and cleaning with your San Antonio dentist is vital to identifying small problems before they turn into large ones as well. Don’t hesitate any longer, you are what you eat, and that includes your smile! At New Image Dentistry, we have five dental experts to help solve and treat your problems. Each of them brings years of experience to our practice, allowing us to provide you with comprehensive care so you don’t have to drive all over town! We pride ourselves in creating a warm and comfortable environment for all our patients and take the time to individually treat each person. For any questions or to schedule an appointment, visit our website or contact us at 210-880-0212.